"This is the alpha and omega of literature on Puccini and eliminates the need to look elsewhere. Carner's access to family history and Puccini's personal correspondence make this a definitive reference. By the same token, it is highly readable for a scholarly biography. It can be read for enjoyment as well as information -- as such, it is a good match for Puccini's art." "Music was embedded in Puccini; behind him, he had five generations of musical history relating to his family. When his father died, Giacomo was only five years old, and the family ruled that his uncle was suitable enough to handle the child's upbringing - as was the custom then prevailing in Lucca (Italy). Unfortunately the uncle considered little Puccini undisciplined, with a bad taste, concerned more about his looks, materialistic, and a bad organizer. So much labelling heaped on an infant of five.!!! 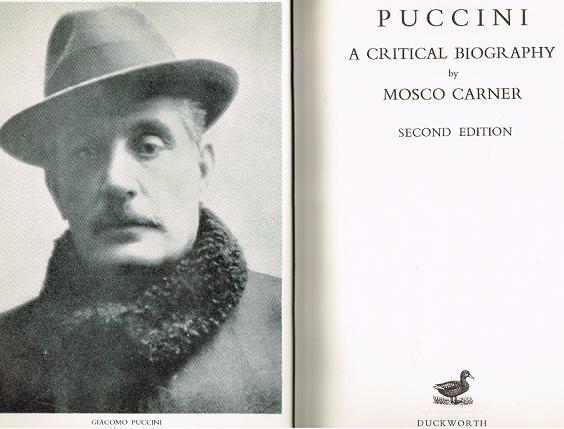 Mosco Carner made of Puccini a fascinating subject for study. ""an artist who bore the authentic stamp of genius but who for some reason failed to cross the boundary into the realm of absolute greatness. If there was ever a 'border- line case', it is Puccini.'"". The author, in my opinion, has been able in his third edition - posthumously though as it is, and thanks to his wife Hazel - to see all the relevant data in the context of meaningful relationship to historical events, and to value his achievements devoid of personal feelings or bias to 'old' political aberrations. We can see that, unlike Wagner, Puccini did not participate in the dominating politics in his days. Mussolini claimed that Puccini applied for admission to the National Fascist Party. This appears to be highly improbable in the absence of records or proofs of any application signed by Giacomo Puccini and submitted to the party. In addition, had Puccini done so, his close friend Toscanini (the linchpin anti-fascist) would, very likely, have severed all friendly connections with him and refrained from conducting his operas? In fact Puccini's personality could not have possibly accommodated for any delinquent demands from the Fascist Party. Puccini was very attractive, vivacious and also impulsive. The great composer did not care for criticism and this trait interfered with his artistic ambitions bordering on playing with fate. But early on, 'Fate' played its role, and played it very well. In his adulthood Puccini took the position of church organist and choir master in Lucca. From such initial experience he adored music, yet it did not become part of him until he saw a performance of Aida (Verdi) that made a sort of divine influence on him to become an opera composer. At the age of 21, he composed the Messa, which marks the culmination of his family's long association with Church Music. The power of the church and the humble prayers of its congregations drew the roadmap for Puccini's works. The acclaim and `Bravo' clapping in appreciation gave glimpses of the moving and vivid power that he would soon release on the stage; hence his powerful "arias" for tenor and bass soloists. Certainly Puccini's music in its orchestration and dramatic impact is more operatic than is current in church music. Perhaps one can go thus far to mention that Puccini's Messa compares quite well with Verdi's Requiem. Like Mahler's experience long before, Puccini's initial participation in a competition did not go well. In 1882 he obtained a Libretto and tried his luck for a One-Act opera but did not win. Three years later his next stage caught the attention of Giulio - the owner of his family music publishers: Ricordi & Co - In 1889, Giulio commissioned Puccini with a second opera - Edgar. His third opera - Manon Lescaut 1893 - was his first great success, followed by La Boheme - 1896, Tosca 1900, and Madame Butterfly 1904. Tosca in particular remains a milestone in Puccini's career. Tosca is by far the most historical opera and one of the most popular and significant event ever written and staged. Tosca is set in a very specific time and place: Rome, from just before midday on June 17, 1800 to a few minutes after dawn on the following day. Any opera lover lucky enough to go to Rome can literally follow in the footsteps of Tosca, from the basilica of Saint Andrea della Valle, to the Farnese Palace , to the fortress of Saint Angelo... history in Tosca is distorted by nationalism and by the vehement anticlerical perceptions of papal Rome shared by Sardou, Puccini and the librettists. Fate struck Puccini's destinies and the industrial revolution played its role in his life, perhaps it has even distracted him. His compositions became less frequent. His passion for driving fast cars nearly killed him in a serious accident in 1903. In 1909, there was scandal when Puccini's wife, Elvira, falsely accused their maid Doria Manfredi of having an affair with her husband. The maid then committed suicide. Elvira was successfully sued by the maid's family and Giacomo had to pay damages. Finally, in 1912, the death of Giulio Ricordi, now Puccini's editor and publisher, ended a productive period of his career. However, Puccini completed more works but of little significance compared with the former four operas. Perhaps his worst habit was cigar heavy chain smoking. Towards the end of 1923 Puccini began to complain of chronic sore throats. A diagnosis of throat cancer was ruled. Puccini and his wife never knew how serious the cancer had progressed. Only his son knew of the seriousness of his father's condition. Puccini's perpetual pain and suffering led his doctors to recommend a trip to Brussels to undergo experimental radiation therapy treatment. Uncontrolled bleeding and complications caused him chronic heart attack. Puccini died in Brussels on November 29, 1924. News of his death travelled fast to Rome during a performance of La Bohème. The opera was immediately ended, and the orchestra played Chopin's Funeral March . The blow stunned a full-house audience. Like Mahler's tenth Symphony, Puccini's Turandot - his last opera - was left unfinished. The remaining two scenes were completed by Franco Alfano based on the composer's sketches made out in illegible handwriting, difficult or impossible to read. Now still an open question whether Alfano followed the sketches or not? The sketches were said to be an open riddle, indecipherable!! When Arturo Toscanini conducted the premiere performance in April 1926, (in front of a sold-out crowd, with every prominent Italian except for Benito Mussolini in attendance), he had chosen not to perform Alfano's portion of the score. The performance reached the point where Puccini had completed the score, at which time Toscanini stopped the orchestra. The conductor turned to the audience and said: 'Here the opera finishes, because at this point the Maestro died". (Some recorded he said, more poetically, "Here the Maestro laid down his pen.'). Puccini died at 66; too soon !! Our beloved Opera Magician was still young."